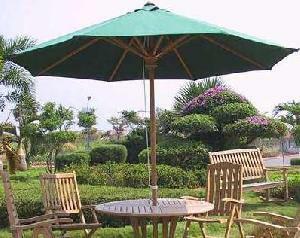 Teak garden Umbrella 9 feet, made from selected teak as we knew teak is the best wood especially for outdoor furniture. Nice and suitable for home, hotel, garden, terrace, patio and outdoor restaurant. FOB Semarang port-Indonesia $ 57.00-75.00 / pc. With folding system made this item simple and easy to carry and storage, no big space needed.